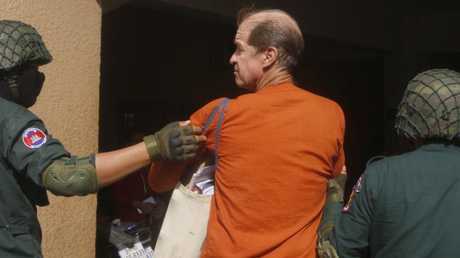 Australian filmmaker James Ricketson gets off from a prisoner truck upon his arrival at Phnom Penh Municipal Court in Phnom Penh, Cambodia. Picture: AP / Heng Sinith. 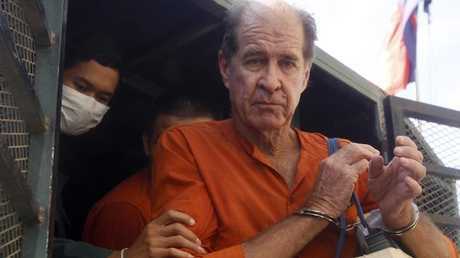 AUSTRALIAN filmmaker James Ricketson has been found guilty of espionage and sentenced to six years in jail. 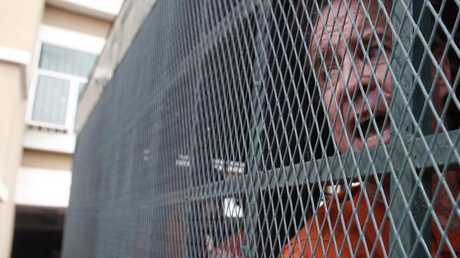 Mr Ricketson, 69, was dressed in prison orange and looked relaxed as the verdict was handed down in a Cambodian court on Friday by a bench of three judges in Phnom Penh. He was whisked away in a prison van yelling: "Which country am I spying for?" Speaking to an AAP reporter from his holding cell before the verdict, Mr Ricketson said based on the evidence he was confident he would be found not guilty of spying for foreign states. 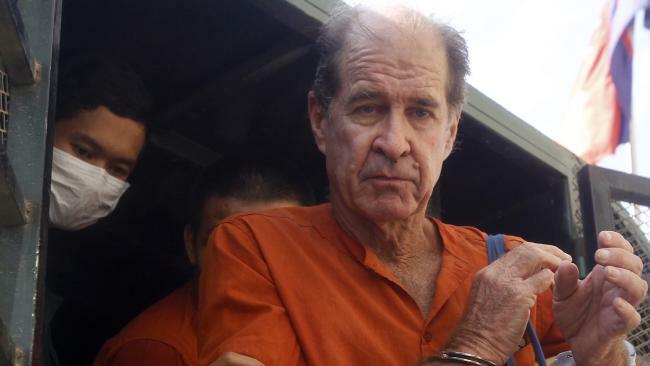 Australian filmmaker James Ricketson in a prison truck as he arrived at the municipal court in Phnom Penh, Cambodia, Monday, Aug. 27, 2018. Picture: AP. Australian filmmaker James Ricketson, center, arrives at Phnom Penh Municipal Court in Phnom Penh, Cambodia, Wednesday, Aug. 29, 2018. Picture: AP. Mr Ricketson was detained almost 15 months ago after flying a drone without a permit over a political rally organised by the now-banned opposition Cambodian National Rescue Party (CNRP). He has always denied the charges. However, the court heard he had offered footage of the rally to then CNRP leader Sam Rainsy for party use and it contained secret locations of security deployments. His computer was seized and he faced a lengthy investigation, involving 15,000 emails and 1600 pages of files, before being charged with espionage dating to 1995. However, prosecutor Seang Sok produced only a handful of emails and 10 photos as evidence he said tied Mr Ricketson to exiled opposition leader Sam Rainsy, who was accused by Cambodian Prime Minister Hun Sen of fomenting a "colour revolution" backed by the United States. James Ricketson gets off from a prisoner truck upon his arrival at Phnom Penh Municipal Court in Phnom Penh, Cambodia, Wednesday, Aug. 29, 2018. Picture: AP. Those emails included a letter for then Australian Prime Minister Malcolm Turnbull, a query to Sam Rainsy regarding an arrest warrant and another containing detail of Hun Sen's personal body guard unit - information Mr Ricketson argued was freely available. However, it was argued the emails suggested Mr Ricketson enjoyed a close relationship with Sam Rainsy that went well beyond that of an independent journalist who was simply doing his job - a cornerstone of his defence. He offered to formulate a 2013 election media strategy, sought CNRP advice on opinion pieces he wrote and told the court: "My opinion at the time was that the CNRP was the better political party." 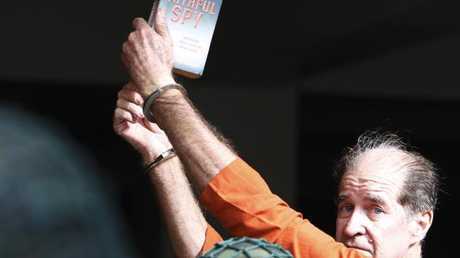 James Ricketson holds a book with the title of "The Faithful spy" upon his arrival at Phnom Penh Municipal Court in Phnom Penh, Cambodia, Tuesday, Aug. 28, 2018. Picture: AP. His lawyers said that did not make him a spy. The prosecutor declined to say who Mr Ricketson was spying for and instead focused his questions on the ABC and the Australian Film Commission, which funded his films. His case won widespread attention and came amid a crackdown on opposition politicians and the media before elections in July, when Hun Sen's ruling party won all 125 seats in the National Assembly. 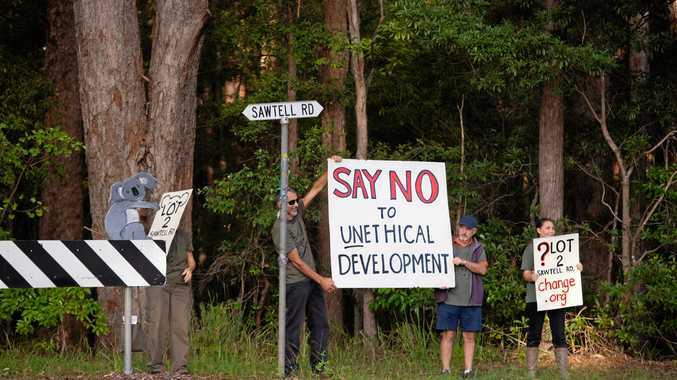 Then foreign minister Julie Bishop intervened after a petition demanding his released garnered more than 70,000 signatures, including high-profile actors Bryan Brown, Sam Neill and director Peter Weir who testified on Mr Ricketson's behalf.